After taking this photo, I went back and did an online search. Guess what? It's an air-condiotioned durian cafe! You know what that means? The smell will linger! 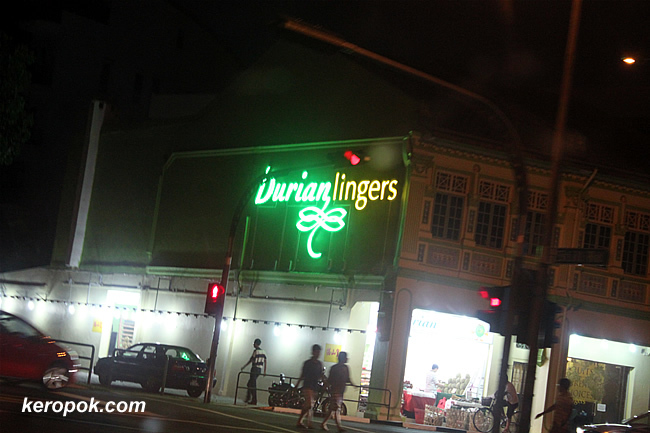 No wonder they are called Durian Lingers! Place for a durian fix all year round eh ? I went there yesterday. Actually, it is not that bad. Although it is air conditioned, the smell doesn't really circulate in the the cafe. The durian tastes not bad. However, there is always a catch. The price of a Mao Shan Durian costs about $25. Well, you can always argue that you are paying for the ambiance. Ya, whole year round durians! I have no idea why I stopped.